Published: Dec. 1, 2012 at 04:39 p.m. Updated: Dec. 2, 2012 at 02:31 p.m.
Joe Linta finds the truth hard to believe. Linta was Jovan Belcher's agent. His relationship with Belcher was a professional one, but he never suspected his client was capable of the violent acts he perpetrated Saturday morning in Kansas City. "Jovan was a happy, proud father, with pictures of his baby on his Facebook page," Linta told SI.com's Peter King in a phone call Saturday afternoon. "This is shocking. Something went crazy wrong, and we'll probably never know what it is." 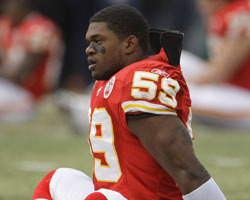 Take a look at photos of Jovan Belcher through the years. Kansas City police said Belcher shot his girlfriend to death Saturday morning, then turned the gun on himself after a conversation with coach Romeo Crennel, general manager Scott Pioli and another coach at the Chiefs' facility. Belcher was an undrafted free agent out of the University of Maine, the kind of long shot Linta has been known to represent. Linta was known to heavily factor in character in these underdog cases. One general manager told King that extensive background work was unnecessary "because they're all borderline Eagle Scouts." "Never until four hours ago did I think Jovan was anything but a model citizen," Linta told King, audibly shaken by the news. "He came to my youth clinics in the offseason and worked with kids. He was a gracious, unselfish, hard-working, dedicated kid -- very, very caring of some of the underprivileged kids who came to the clinics. I saw him in a real positive way. "I never take on anyone as a client I wouldn't be proud to take home and spend time with my wife and kids. Jovan was one of those type of people. "There's no word for this other than shocking. That's all I can think of." Linta also serves as Crennel's agent. He was asked how the coach will handle the fallout of this tragedy. "With dignity, like everything Romeo does in his life," Linta said. "Life doesn't hand you roses all the time. But Romeo is a salt-of-the-earth kind of person who will rely on his faith and his determination to do what he has to do, to do what's right. He will know what to say to his team, because he always knows what to say." The Chiefs announced Saturday they will play the Carolina Panthers as scheduled Sunday.